E.ON UK has begun commercial operations at its Holford gas storage plant in Cheshire in the north-west of England. Once completed, the projected gas withdrawal rate at the facility will be 16 MMcm/day – sufficient to qualify the Holford gas storage plant as vital backup infrastructure for supplying fuel to gas-fired power plants. General Electric (GE) will upgrade two 9B gas turbines to GE 9E gas turbines in an E.ON power plant in Trapani, located in the west of the Italian island of Sicily. E.ON selected GE to upgrade Trapani's two gas turbine trains from 85 MW and 89 MW, respectively, to 107.8 MWs per unit. Indonesia's state electricity company PT Perusahaan Listrik Negara (PTLN) is forging ahead with plans to increase LNG imports as a fuel for gas-fired power generation with the aim of denting the country's energy hunger. Nur Pamudji, PTLN's recently appointed president director, said a milestones in 2012 would be that "for the first time, we are going to utilize (LNG) in our electricity system". BDEW, Germany's energy and water association, today released data on the country's power generation mix. Gas-fired generation was virtually unchanged at 14% in 2011. The share of renewable energies in the country's overall power generation mix surged by 20% in 2011, according to BDEW statistics. In 2011, renewable energies have already overtaken nuclear plants (18%) and coal-fired power generation (19%) in terms of market share. China Machinery Engineering Corp (CMEC) has won a $1.19 billion contract to build a 1,260-MW gas-fired power station in Iraq. CMEC will construct the plant over a timeframe of 45 month in Salahuddin governorate north of Bagdhad, an Iraqi electricity ministery spokesman told local reporters during the signing ceremony in Baghdad on Thursday. Societe Generale is anticipating that 2011 will be far worse than 2009 for gas demand. The year 2011 has so far seen a 9.3% yoy drop in gas consumption and a 1.9% decline in electricity demand, Societe Generale said in its latest SG Energy Pulse report. General Electric's LM6000 aeroderivative gas turbine technology was chosen for an expansion of a Russian power plant to meet growing electricity demand of the city of Yuzhno-Sakhalinsk, located on Sakhalin Island in eastern Russia. China Gas has rejected a bid from China Petroleum & Chemical Corporation (Sinopec) and ENN Energy, saying the offer of $2 billion in cash to buy the entire company would not fully reflect its value. Sinopec and the Chinese gas distributor ENN Energy had made a joint bid of HK$3.50 ($0.45) a share for the Hong Kong-based gas distributor China Gas, they said in a regulatory filing to the Hong Kong stock exchange . BG Group will sell the entire volume of natural gas produced at Kazakhastan's vast Karachaganak gas condensate field to local utilities for use in CNG vehicles and power generation. "All raw gas produced from the Karachaganak field is sold locally and into Russia or it is re-injected into the reservoir to help maintain reservoir pressure," Mark Todd, spokesman for BG Group, told 'Gas-to-Power Journal' today. Siemens Energy has received a first order for the supply of its SGT-750 industrial gas turbine. The buyer is Wingas, a joint venture of the BASF subsidiary Wintershall and the Rus-sia's Gazprom. Siemens is responsible for supply, installation and commissioning of the SGT-750 gas turbine together with the generator and auxiliaries, and for the electrical infrastructure for the grid connection. Alstom, the French engineering company, has secured a contract worth €400 million to build the 728MW gas-fired power plant in Al Mansuriya, north east of Baghdad in Iraq's Diyala Governorate. The first unit of the plant is slated to start operations in early 2013. Siemens has started to build a new combustion test center for gas turbines near Berlin, the German engineering company announced today. "We are investing 66 million euros to be able to study and validate the combustion processes in gas turbines in our own test center," said Roland Fischer, CEO of the Fossil Power Generation Division within the Siemens Energy Sector. Stadtwerke Düsseldorf's board has approved the construction of a 400 MW combined cycle gas turbine (CCGT) plant in the city to come online in 2016. The German municipal utility took a final investment decision (FID) on the plant, taking into account projections on fuel costs and the expected balance between electricity supply and demand in Germany. Germany's E.ON is on track to comply with the new regulation to power generation assets in the UK against the dangers of climate change such as flooding, Richard Busby, E.ON's Environment Manager said. E.ON has identified this risk at two of its power stations and has now introduced new Reverse Osmosis water treatment plants to tackle the problem. The Enfield power station doesn't have access to river water for cooling and has to use air for cooling. Enterprise planning combined with project execution is deemed to be the way forward for unleashing the value of integrated power generation solution, Oracle – IFS Partner said in a White Paper emailed to 'Gas-to-Power Journal' today. 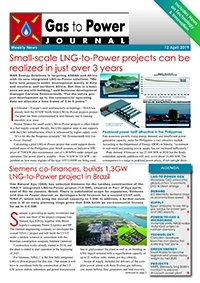 Gas to Power Journal is a specialist publication for the natural gas power generation industry, supplying analysis and insight on topics including combined cycle gas turbine technology and gas fired power plant efficiency, as well as developments in plant projects, financing and markets. Our daily updated journal provides insight into the UK, European and world energy markets for those seeking to explore the technical, strategic and commercial opportunities in natural gas power generation and its related topics. In addition, our website tracks the commercial development of new natural gas power generation projects, through the planning, project finance and construction stages, and on to the procurement of gas supplies. 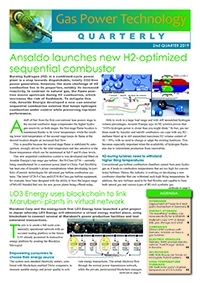 Trading, pricing and product specification trends are highlighted, while regulatory and policy developments are tracked in related fields that may impact the security of natural gas power supply. Shifting demand patterns for natural gas power generation, as a part of global energy demand, are also covered, as part of our in-depth analysis. Explore the latest innovations in natural gas power generation technology and the most efficient ways to integrate gas power with natural / renewable energies, with Gas to Power Journal.